Attendees enjoying our first annual pancake breakfast before the market poultry auction begins. 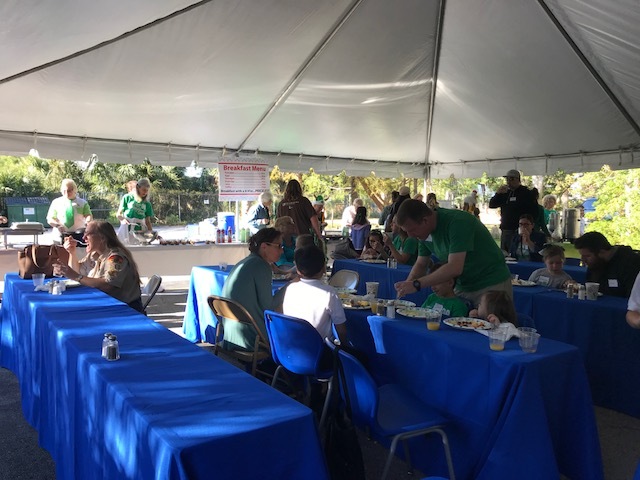 Last month, UF/IFAS Extension Brevard County hosted their annual 4-H Fair and Market Poultry Auction. Nearly 200 people attended the two-day event, which included an ice cream social and a pancake breakfast. Kids, parents, and visitors all had a great time and there was something for everyone to enjoy! Almost 75 4-H members participated in this year’s 4-H Fair. Many 4-H members entered exhibits such as photography, home-grown fruits and veggies, and sewing projects into the Fair for judging. 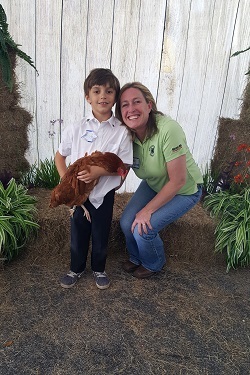 44 youth also participated in the poultry and rabbit competitions at the 4-H Fair. Dr. Tommy Andrews spent the day judging all of our poultry and rabbits, and talking with the kids about their animals. Gordon and one of his buyers in the market poultry auction. It was his first time participating in the market poultry project! The event concluded with a pancake breakfast and our annual market poultry auction. All of our 4-H families, as well as our poultry buyers, were invited to attend. Attendees enjoyed four-leaf clover shaped pancakes while our 4-H members introduced themselves to our poultry buyers. 120 New Hampshire hens were raised by 40 of our 4-H members over the last year, and these birds were auctioned off to over 20 different buyers. The average purchase price per bird was $100.00, and the auction took in over $12,000. This money goes back to our 4-H youth who auctioned off their birds, and they use the money to fund their next animal project or save it for college. Animal projects like the market poultry project teach youth life skills such as responsibility, financial management, and problem solving. The development of these skills help youth improve in their 4-H projects each year, but more importantly these life skills are essential for youth to become responsible, successful, well-adjusted adults. Brevard County 4-H works to help youth develop these essential life skills through all of the projects and programs. For more information on Brevard County 4-H, contact Andrea Lazzari, 4-H Agent, at (321) 633-1702.